A team of Egyptian archaeologists digging at Tel Habuwa, near the town of Qantara East and three kilometres east of the Suez Canal, have made a major discovery. The find comes as part of the search for more of the ancient forts that played a major role in protecting ancient Egypt's eastern gateway from foreign invasion. 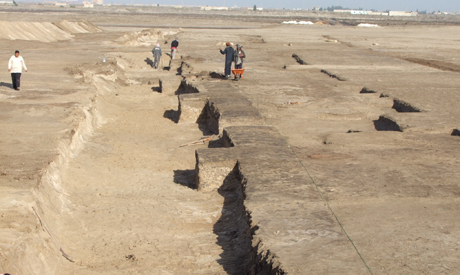 During excavation works, archaeologists chanced upon the remains of administrative buildings dating back to the Hyksos and the New Kingdom periods in the second millennium BC, as well as a great many grain silos. Each administrative edifice is a two-storey structure with a number of mud brick rooms and courtyards. Inside these halls a collection of coffins, skulls and skeletons of human beings and animals were found buried in sand. Early studies of the skeletons reveal that they bear deep scars and wounds as the result of being stabbed with arrows or spears. "This indicates that the battles between the Hyksos and the military troops led by the ancient Egyptian king Ahmose I (c.1550–1525 BC) were violent and aggressive," said Minister of State for Antiquities Mohamed Ibrahim. Ibrahim said that a large number of grain silos and army storage galleries from the reign of kings Tuthmose III and Ramses II were also discovered. These silos can store more than 280 tonnes of grain, which indicates the great number of the Egyptian army forces which were at Tel Habuwa at that time. Mohamed Abdel Maqsoud, leader of excavation work and deputy of the Ancient Egyptian antiquities department at the antiquities ministry, told Ahram Online that the remains of burned buildings were also found, confirming written accounts on papyrus that describe a great conflagration during Ahmose I's battle against the Hyksos. "This this is a very important discovery which provides us with a better understanding of the Rind papyrus -- now on display in the British Museum -- and the military strategy used by the Pharaoh Ahmose I to liberate Egypt from the Hyksos," said Abdel-Maqsoud. He pointed out that the Rind papyrus mentions that Ahmose attacked Tharo and imposed his authority on the town in order to lay siege to the Hyksos in their capital Avaris -- near the Delta town of Sharqiya -- and block any contact with their allies in the east. Until 2003, when the fortified city of Tharo was found, Abdel Maqsoud said, nothing was known about this military town. At that time several objects were found testifying that Tharo dated from the New Kingdom, so Egyptologists believed that it was built by Ahmose I's successors in an attempt to protect Egypt's eastern gate from any further invaders. This latest discovery, however, proves that Tharo was built long before that, since the Hyksos took over it as a military base on Egypt's eastern border. The town expanded after the war of liberation, and forts were built throughout the period of the New Kingdom.